Nine years after the release of Quest For Glory: So You Want To Be A Hero, Sierra Entertainment’s Quest For Glory series of games had become one of the most venerable franchises in the developer’s rich portfolio of PC adventures. The Quest For Glory titles had always set themselves apart from the competition during the heyday of the adventure genre of the 1990s through its combination of adventure and RPG elements – and through its trademark sense of (sometimes pretty juvenile) humour. 1998’s Quest For Glory V: Dragon Fire changed the formula somewhat, putting the emphasis more on the RPG side of the equation and featuring a variety of weapons, armour and magical items. Equally, its story was a lot more conflict-driven than those of most other adventure games – the protagonist’s mission was to vanquish a series of enemies during Rites of Rulership, and finally to defeat the dragon that threatened the kingdom of Silmaria. Quest For Glory V continued the series’ commercial success, but the shutdown of several of Sierra’s development studios in 1999 meant that Dragon Fire would sadly be the last instalment of this tradition-rich franchise. While fondly remembered by adventure game fans, Quest For Glory V ultimately left its mark on the game industry in a different way: through its soundtrack, which turned out to be one of the first live orchestral scores written and recorded for a Western game. The artist and driving force behind Quest For Glory V‘s music was a young Chance Thomas (Lord of the Rings franchise, King Kong), at the time an emerging composer who had mainly worked in television and advertisements. Unfamiliar with game music at the time, Thomas was made aware by a neighbour that Sierra was looking for a composer for Quest For Glory V. After a demonstration of game music’s potential through the opera scenes in Sierra’s Gabriel Knight 2: The Beast Within, Thomas submitted for the position and won the job. Unaware of the limitations of technology and of then-current game scoring standards, Thomas pressed for the use of a live orchestra – in 1996 an absolute novelty for a Western PC or video game. While meeting some initial resistance, Thomas found an ally in Quest For Glory V‘s Software Design Engineer Eric Lengyl. Eschewing the MIDI industry standard, Lengyl and Thomas designed an adaptive audio engine that was capable of playing back digital audio streams – in other words, recordings of a live orchestra. In retrospect, it proves insightful to compare how the orchestral scores on Quest For Glory V and Michael Giacchino’s The Lost World: Jurassic Park came to be. In both cases, outsiders to the world of game music (Chance Thomas and Steven Spielberg) joined the party and transferred their expectations of how soundtracks were recorded onto the game industry, and in the process they began to shift the industry’s standards. 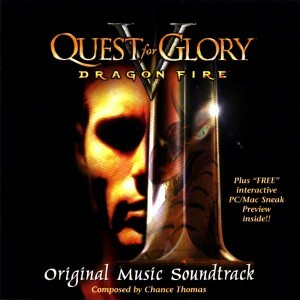 While it’s difficult to say which Western game was the first one to feature a live orchestral score – it’s a close race between Quest For Glory V, The Lost World and Bruce Broughton’s Heart of Darkness – there’s no question that Thomas did pioneering work on Quest For Glory V that would have a lasting impact on the history of game music. However, Thomas still had to work within the confines of a limited budget, recording Quest For Glory V‘s score with 32 members of the Utah Symphony – fewer musicians than were available to Giacchino and Broughton. To achieve a reasonably big sound that would befit the game’s lush fantasy world, Thomas recorded strings and brass multiple times and stacked them in the mixing process, while also adding sampled and electronic elements. 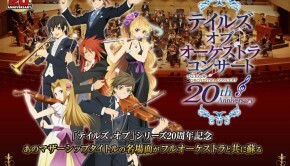 The fruit of all this pioneering labour was made available as a bonus item of the game’s Collector’s Edition released in 1998, presenting 48 minutes of the more of two hours of music written for the game. Not surprisingly, these CDs soon became sought-after items, but this situation was remedied in 2007, when Quest For Glory V made its way into the iTunes online store, finally returning this highly influential soundtrack to the catalogue. Additionally, a small number of Quest For Glory V‘s CDs are still available via Thomas’ website. After all this historic detail and background, the question remains how Quest For Glory V holds up on purely musical terms. Fortunately, it does so very well. From the moment Marc Seibert’s classic Quest For Glory theme bursts forth on enthusiastic brass on “Quest For Glory V Overture” to open the album on a swashbuckling note, it’s obvious that Thomas has grabbed the opportunity to write a full-bodied fantasy score with both hands. Composition-wise, “Quest For Glory V Overture” is an excellent way to kick off Western game music’s foray into live orchestral music, as the composition seamlessly shifts between rousing, instantly memorable statements of the Quest For Glory theme, beguiling and lyric interludes that give the strings and woodwinds time to shine, and belligerent action passages. The return of the Quest For Glory theme on solo flute towards the end is a particularly charming touch before the track finishes with one last sweeping statement of the theme – which will later return to hail victory over the dragon on “The Great Hall of Kings” to bookmark the score. In a more than one way, “Quest For Glory V Overture” is an outstanding introduction to the album, introducing melodies that will feature throughout the score and highlighting the various moods that the soundtrack will encompass – it’s going to be a colourful journey. However, “Quest For Glory V Overture” display not only the album’s strengths, but also its most glaring issue. While Thomas does an outstanding job at working with limited resources and throughout Quest For Glory V squeezes every last drop out of his 32-piece orchestra, there’s no way to hide the lack of ensemble depth. Particularly the brass lacks depth and power, and the recording and mixing of the orchestra is certainly not the last word in clarity, as orchestral lines and textures tend to blur and turn muddy particularly during the album’s busy action pieces. It’s a testament to Thomas’ compositional prowess that his music is strong enough to overcome this impediment, but one can’t help wondering what a proper re-recording could do for Quest For Glory V.
After the attention-grabbing opener that is “Quest For Glory V Overture”, the album alternates between calm scene setters and driving action pieces to ensure a dynamic album flow and sufficient variety. It’s particularly on the quieter pieces that Thomas’ creativity shines through, as he shows himself adept at livening up the genre-typical orchestral palette of Quest For Glory V through the addition of solo instruments, voices and electronics. The focus on solo voices and the use of electronics will partially be related to budget constraints, but Thomas wields these elements well enough to make Quest For Glory V a more intimate score than others of its fantasy genre ilk. Of these mellower pieces, the most spellbinding one is fan favourite “The Dance of Mystery and Intrigue”, following straight after “Quest For Glory V Overture” and opening the album with an impressive double whammy. Markedly different from “Quest For Glory V Overture”, “The Dance of Mystery and Intrigue” earns its name through a rising and falling piano figure, whose intriguing rhythmic stop-start progression gives it a hypnotic effect. Ethereal, floating female vocals layered on top of the piano melody increase the heady atmosphere, which becomes even more intoxicating when a solo acoustic guitar begins to accompany the piano. On a soundtrack with its fair share of strongly atmospheric pieces, “The Dance of Mystery and Intrigue” is a standout. Its fellow compositions aren’t far behind though. 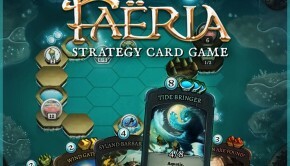 “Silmarian Meanderings – Day and Night” emphasises the exotic nature of Quest For Glory V‘s setting. The track’s opening marries Latin and Near Eastern influences by combining an acoustic guitar with warm, gently grooving hand percussion rhythms to paint the image of a welcoming, sun-kissed location. However, the music turns truly evocative and original through some creative additions such as bass clarinet and solo violin soli, which contribute brief rhythmic and melodic motifs. While not always convincing, here the album recording does a great job at delineating the web of intricate instrumental layers, lead by the solo guitar. The piece’s second half – underscoring night in Silmaria – isn’t quite as interesting as the instrumentation changes to a relatively sparse piano solo against more contemporary, smooth rhythms and gliding voice and sound effects. Thankfully, despite its gentle demeanour and stylistic familiarity – it’s mostly starry-skied new age sounds – the music doesn’t fall into a lull, due to the sufficiently emotional nature of the solo piano part. “Undersea Exploring” heralds the introduction of synths in a more prominent role. The cue’s depiction of submerged worlds is familiar, but effective – solo guitar against a glistening synth background, later joined by a tinkling piano. In the track’s second half, the strings intonate a measured, rising melody that turns out to be one of the score’s secondary motifs, the Atlantis theme. Both appropriately noble and melancholic, the theme returns on the more expansive “The Rite of Peace”, which explores the mix of orchestra and synths in more depth. Backed by silvery, shifting synth pads, the theme provides enough snippets of melody to give the piece its elegiac grace. Despite its relatively static, slow-moving nature, the composition doesn’t fail to develop, as the synth backdrop turns more forbidding, almost dirge-like, beautifully contrasted by rising string melodies that are aided by a synth choir. The ensuing mini-climax caps off the piece’s convincing development – a trait that marks many pieces on Quest For Glory V and underpins the music’s storytelling ambitions. “The Rite of Destiny” and “The Rite of Courage” are shorter mood setters clearly modelled after their longer brethren, but they maintain the album’s flow. The odd one out is “Frolic at Gnome Ann’s Land Inn”, a jarring transition after “The Rite of Peace” into the trappings of tavern music as heard in many fantasy games. The jovial charm of the track’s light dance rhythms, accordion sounds and hand clapping becomes a bit stale over time, although the woodwind and guitar soli set against the bouncy backdrop make the tracks a lot more attractive. And hearing the Quest For Glory theme played on accordion is undeniably a fun touch. Befitting the game’s focus on battles, the rest of Quest For Glory V‘s soundtrack consists of action cues. Even more than the quieter pieces, these benefit from Thomas’ multi-layered orchestrations and ear for orchestrational details. With belligerent battle cries like these, there’s always the danger that the music descends into more or less monotonous brass and snare drum pomp if the composer simply goes for volume and aggression. Not so here – apart from the repetitive snare drum rhythms that dominate “A Day in the Arena” way too much, Thomas injects his battle cues with enough melody and development. The first action track “The Rite of Freedom” starts in moribund fashion with a deep rolling string motif and tentative woodwind melodies, mirroring the desolate state of Silmeria’s villages after an invasion. The piece gradually builds to a passionate melodic outburst at 1:20, and after that the fight begins, carried by cleverly composed snare drum rhythms and dramatic, layered brass motifs that keep rising until a victorious finale with peacefully fading chords. Unfortunately, it’s particularly on a forte composition like this that the less than punchy brass diminishes the music’s appeal somewhat, although not to a critical degree. Only on “The Rite of Justice” does the lack of ensemble depth become a more serious issue, as the piece goes for a more monolithic sound than previous compositions. However, the relatively puny brass sound isn’t enough to replace the stirring frenzy of earlier action cues, although the piece still manages a decent build up towards the end, turning denser and denser over its insisting rhythms. Other battle cues jump into the action head on instead of building towards it, but they remain exciting and adrenaline-pumping examples of how to write intelligent fantasy battle tracks. “The Rite of Conquest” betters “The Rite of Freedom” with its shifting orchestrations that see different sections of the orchestra taking over the lead role throughout the piece’s running time. The cue finds space for woodwinds and harp amongst the stirring march bombast, which in itself is sufficiently layered to never turn monotonous. Also worthy of note is the appearance of another secondary motif on “The Rite of Conquest” – a martial, short melody that was first presented on “Quest For Glory V Overture” and will later return on “The Rite of Justice”. On “The Rite of Valor”, Thomas counters the proudly rising brass motifs with a descending deep woodwind line. The resulting countermotion is not only a prime example of the fine details hidden within Quest For Glory V‘s orchestrations, but it also makes “The Rite of Valor”’s more primal rhythms all the more gripping. Leading it all to an appropriately big finale is “Dragon Fire”, which from its unusually dark opening announces itself as the album’s most dramatic track. Like “The Rite of Justice”, it starts out a bit less agile than earlier action cues, but the pounding percussion rhythms are recorded and mixed well enough to give the music the impact it needs. With not one, but two big climaxes and an excellent command of dynamics, “Dragon Fire” is a roller coaster that flares out with an elaborate, nicely symphonic finish, bringing the album’s narrative arc to a satisfying finish. What makes Quest For Glory V‘s battle tracks still more enticing is their thematic coherency: “The Rite of Freedom” starts out with a cautious four-note woodwind motif that’s featured early on in “Quest For Glory V Overture”. The motif then returns in more determined manner on “The Rite of Conquest” where it counters the combative brass figures; on “The Rite of Valor” in its most grim rendition; ending “The Rite of Justice” on a triumphant note; and finally opening “Dragon Fire” in its most dramatic statement on full brass. The theme most likely represents the hero and his fighting spirit, and as shown, Thomas puts the melody through a number of fitting alterations, as it comes to represent the hero’s growth and increasing courage, and effectively turns into Quest For Glory V‘s main theme. Closing out the album are a handful of bonus tracks. Of these, “Ambient Tour” is the most interesting one – a compilation of some of the 200 ambient cues written for the game. 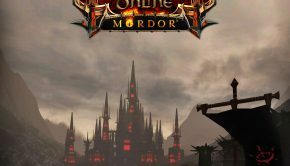 “Ambient Tour” segues quite seamlessly between the various short bits and pieces that make up its running time, more coherent than similar ‘montage’ cues on Thomas’ later scores like The Lord of the Rings Online: Riders of Rohan. The track’s approach to presenting the game’s ambient music is actually quite well-chosen, as these cues might not be able to sustain a whole track on their own, but in this format they get to contribute some of their colour and charm. Most enjoyable about “Ambient Tour” is that further it highlights Quest For Glory V‘s Near Eastern elements. “Greazy” and “No Sweat” are added for a dose of self-consciously cheesy humour, both cues written for the hero’s gym workouts with a dose of 80s synths and more noteworthy for their humorous intent than for their actual substance. One of the first of its kind, Quest For Glory V is by no means a carefully treading exploration of the opportunities that live orchestral scores offer to game music. Instead, Thomas writes a fully-developed, confident fantasy score that right from the start sets the bar high for orchestral game scores and demonstrates that game music does not need to suffer from inferiority complexes when peering over at its more established film and TV cousins. What’s more, Thomas doesn’t simply transfer cinematic fantasy scoring conventions and transposes them onto his game score debut, but instead he manages to infuse Quest For Glory V with a character of its own. The album’s colourful scene setters gain character through the harmonious mix of orchestra and synthesisers, the use of Latin and Near Eastern sounds, and the judicious inclusion of solo instruments like acoustic guitar and bass clarinet. The quite numerous, raucous action tracks are more traditional in their style, but equally display Thomas’ talent for creating well thought-out orchestrations and writing tracks that develop satisfyingly. If there’s any real fault to find with Quest For Glory V, it’s the fact that there’s only so much one can do to hide the very small orchestra size. It’s far from a game breaker, but there’s a definite lack of both punch and clarity, particularly on the busy action cues. However, this drawback should not hold back any fan of orchestral game music – after more than 15 years, Quest For Glory V still resides in the upper echelons of fantasy game scores. Posted on March 21, 2014 by Simon Elchlepp. Last modified on January 17, 2016.